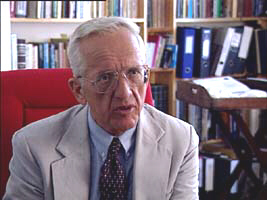 Professor Colin Campbell, who was trained at Cornell (M.S., Ph.D.) and MIT (Research Associate) in nutrition, biochemistry and toxicology, spent 10 years on the faculty of Virginia Tech's Department of Biochemistry and Nutrition before returning to the Division of Nutritional Sciences Cornell in 1975 where he presently holds the endowed chair of Jacob Gould Schurman Professor of Nutritional Biochemistry. In addition he is co-chair of the World Cancer Research Fund. 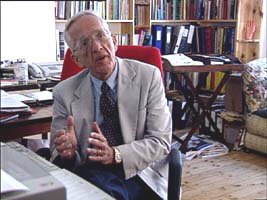 His principal scientific interests, which began with his graduate training in the late 1950's, has been on the effects of nutritional status on long term health, particularly on the causation of cancer. 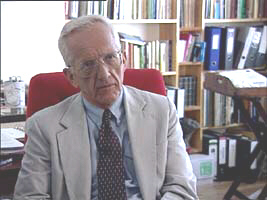 Professor Campbell was interviewed in 1997 by One-Off Productions for their TV documentary, McLibel: Two Worlds Collide. Could you give us a brief introduction to your work and interests? My experience and interest over the years has been concerned with the prevention of cancer primarily, particularly the prevention of cancer by dietary means. I happen to now believe very strongly that nutrition has a lot to do with whether or not we get cancer. It is an area that has been unfortunately underplayed and in some cases actually ignored by some of the central authorities who are involved in doing cancer research. Does this view set you apart from others in your field, are you considered a maverick for example? I'm not alone actually in this view but, it's true that as far as budgets are concerned and as far as the emphasis given to this area is concerned there is not near enough. It's ironic that traditional cancer research organisations and health organisations will admit that at least a third of all cancers can be prevented by dietary means, but then in the next breath, they'll tell you that they really don't know how. Then you ask them how much money are you spending on this, and what you discover is that they're only spending about 1-2% of their budget at the most. There is some terrible discordance here. At first I enjoyed the debate, and the exchange on a personal level. But on the other hand I found these settings to be somewhat troubling in the sense that science and law don't exactly agree on what the terms of the discussion ought to be. Moving onto the McLibel trial. What has been your personal reaction to your time in court? At first I enjoyed the debate, and the exchange on a personal level. But on the other hand I found these settings to be somewhat troubling in the sense that science and law don't exactly agree on what the terms of the discussion ought to be. The legal profession and the court defines the limits of the discussion and they focus on very specific issues, whereas scientists like to think we can let the conversation go where it may. This area concerning diet and cancer is a very complex relationship from a biological perspective. And to focus on just one thing, one cause, one kind of cancer for example, and let the entire story rest on that kind of focus, is just simply inappropriate. In the case here, there is a lot of emphasis given to the relationship between dietary fat and breast cancer as if the whole story is going to rest on that. That's not the way it really works, we have to look at the whole picture. With regard to the whole picture - a typical McDonald's meal that a family eat. What are the key constituents of what they're eating in that meal that you want to analyse? As far as the meat and the things they add to the to the bun, there is nothing so far as nutrition is concerned that we can't get from other sources that are better overall. Meat offers us nothing as far as the central nutrients are concerned that we can't get from plant material. In addition those kinds of foods are usually high in salt, often times high in sugar, and of course high in fat and high in animal protein. They contain very little or no dietary fibre except the odd bit that might be present in the bread. They contain virtually none of the anti-oxidants. As you begin to examine the bit-parts of the of their meal, there is nothing that's of any benefit, and in my view that kind of food is really not helpful. What effects do you believe that this type of meal might then have? Not only is it not helpful, but also a lot of the things as far as nutrients are concerned are actually quite harmful. The high fat intake, the high animal protein intake, the lack of these other things, lead into increased risks for cancers of various incendiary kinds, increased risk of the various kinds of heart diseases, diabetes; the kind of disease that actually kill upwards of three quarters of us in Western society before our time. It's a really serious problem and it's certainly not the kind of product that ought to be promoted on the grounds of good nutrition, because it's not. And from your studies what links or effects has this? Dietary fat has received a lot of attention, as far as, it's relationship with cancer is concerned. And it's clear that the higher the fat intake, the higher the risk for various incendiary kinds of cancers. The extent of the increased risk depends on the individual circumstances, what else they eat, and so on. In some circumstances the dietary fat effect may not be that great for certain cancers, in other cases it may be more, but nonetheless, increased intakes of fat, if it does anything, will increase cancer risk, period. There is good consensus on that particular point. Increased intakes of dietary fat also increase dietary cholesterol which in turn relates to heart disease. High intakes of dietary fat such as are found in the UK and the US and other Western countries, is not to our advantage. It's a problem. But in addition to the dietary fat, the increased intakes of animal protein that tends to come along with these kinds of diets, in my view has been vastly undrated and also is a significant problem. Dietary fat has received a lot of attention, as far as, it's relationship with cancer is concerned. And it's clear that the higher the fat intake, the higher the risk for various incendiary kinds of cancers. Animal protein is unlike plant protein. Plant protein tends to be protective and preventive of these kinds of diseases, animal protein in contrast tends to increase these kinds of diseases. Other things such as the the hundreds or thousands of different kinds of anti-oxidant materials that are present in food are only found, really, in plant material. They're not found in animal material. And these really wonderful kinds of chemicals have all kinds of beneficial effects in preventing cancer, in keeping the cholesterol in the form that doesn't cause the adverse reactions. This is a very clear link that you're pointing to. Could you give us an account of the main study that you've performed to bring you to this conclusion? Yes, the study that I've been involved with for about 15 years is located in rural China, where, the Chinese experience of the 70s and early 80s shows that about a dozen different cancers had localised only in certain different regions of the country. The localisation was very intense for certain cancers. We could see for example lots of cancer of a certain kind in certain areas, and, not too far away, virtually none of that kind of cancer. The same was true of heart disease in China. And so it was an ideal place to go and do a study, to see what it was about these areas that raised the risk to such intense levels. The other advantage of doing the study in China was the fact that the people living in these regions tend to live there all their lives, and they tend to produce the same kind of food year in year out, and more or less eat the same kind of food. It was a perfect setting experimentally. We designed the study, primarily with the assistance of Professor Peto, University of Oxford, to measure as many things as we possibly could in the dietary lifestyle sense, and then compare that with the various incendiary kinds of disease mortality rates, to see what really were the significant factors that were likely to be related to these diseases. We ended up at the end of the day with a list of factors, and other features of those populations that was more comprehensive than has ever been conducted before in any study. It gave us a chance in particular, of looking at the more comprehensive effects of the big things in life, the big things in diet that could be related to these various diseases. How would you summarise it in terms of cancer and the sort of diet that's been talked about in this case? Well, for the kinds of cancer we tend to see in the UK and the US, those cancers are much less in China. Firstly, the kind of diet that was consumed in China is very low in total fat. The range was between 6-24% of calories, for example, whereas in this country the range is more of the order of the high 20s-high 40s. Their high was nearer our low, and so it gave us a chance to see really what was going on down at that scale of things as far as the diet is concerned. And what we found was something really quite remarkable. It turns out that as the dietary fat intake begins to rise from the very low levels their blood cholesterol begins to rise as well. They're correlated, and, as the cholesterol begins to rise, other things also present in the blood begin to change, and as one begins to put animal products into their diet, then these kind of diseases begin to appear. As dietary cholesterol increases from these very low levels in response to the increased intakes of animal-based foods, dietary cholesterol begins to increase. There are a number of different cancers which also begin to increase, such as breast cancer, colon cancer and, in fact, some of the other cancers that are somewhat more common in China. And the determinants of dietary cholesterol are the animal-based foods. As the cholesterol begins to go up these specific kinds of cancer also begin to rise. That's the general essence of the story. There are a number of different cancers which also begin to increase, such as breast cancer, colon cancer ... as the cholesterol begins to go up, these specific kinds of cancer also begin to rise. Would you say that the western diet is moving out to other countries and is having an effect? Yes it definitely is. 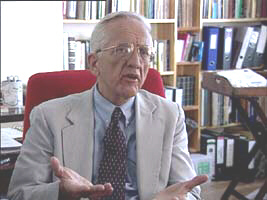 In poor countries of the world, or in emerging, or developing countries, their disease patterns are such that they are burdened with the infectious communicable kinds of diseases because of their poor conditions, poor public health facilities, and in some cases because of their lack of food - total calorie intake. But as they begin to get more capital and more resources and particularly as they become more industrialised they begin to become more organised, and one of the first things that societies want to do - it happened here, it happened in the States, it happens every place - one of the first things that they want to do is to increase their intake of animal food. I mean meat is, let's face it, meat is a status symbol as far as society is concerned. So they start buying this kind of food, they start consuming this kind of food, and their diets change rather quickly - it's happening in China. And as western fast food chains begin to come in, obviously that's the kind of stuff that they're selling. And just because these companies obviously are from the west, they have a certain attraction from a marketing point of view. People start using this kind of food and it's the last thing they ought to be doing. The traditional diets in these countries are usually low in salt, low in refined sugar, low in animal based foods, so therefore they're low in total fat. They're low in animal protein obviously, they're very high in dietary fibre, anti-oxidants and all the good things. As they begin to get more resources, and are able to change their diet, they change their diet to increase their intake of animal based foods, increase their intake of refined sugars, and increase their intake of salt. And as western fast food chains begin to come in, obviously that's the kind of stuff that they're selling. And just because these companies obviously are from the west, they have a certain attraction from a marketing point of view. People start using this kind of food and it's the last thing they ought to be doing. At the same time they're starting to eat that kind of food in their homes as they gain more resources at the personal level. And so, in China for example, what we see there if we go to the city area, is fat intake dramatically increasing within just a few short years. Cholesterol levels are shooting up, and suddenly you see cancer and heart disease being the number one and number two killers in these cities. It happens quickly, within a generation or so. We call this the epidemiological transition. The diets that are associated with increasing risks of heart disease and cancer are sometimes called diets of affluence. The diseases that are produced are the diseases of affluence. I rather liked the term, diseases of nutritional extravagance, I think it's a better term to describe really what's happening. Is that a generally held view? Yes, this idea of getting better health by eating plant based foods, is catching on. Some of the more established bodies such the World Health Organisation, for example, have recently given more emphasis to this idea. The national agencies in different countries are beginning to make this point, and quite assertively in some cases, and so the story is spreading. Presently in fact we have a new, world-wide, expert panel that I happen to co-chair, that, is dealing with the question concerning the dietary prevention of cancer world-wide. We have on that panel representation from ten different countries and we're working on what kind of recommendations can be made that are consistent with the very diverse patterns of dietary practices that are seen around the world. It's really catching on quite nicely I think. It takes time and there is a lot of resistance but it really is starting to spread. McDonald's response to what you've said is that it's alright to eat their products because one eats them as part of an overall balanced diet. So, adding the McDonald's component doesn't do any harm. What would your response be to that defence? Well, I've forgotten exactly the figures, or the number of calories and the amount of fat and the amount of animal proteins and salt and sugar that's in their products, but suffice to say that eating a Big Mac in one day's time, is a lot of calories and a lot of fat. I really disagree with their proposition. It can make a difference, and, just on a practical level, if one is accustomed to eating a burger on occasion, we tend to adapt our taste to that sort of thing and so we're not satisfied with just having an occasional burger, it just doesn't work that way. But people aren't only eating McDonald's products, they're eating it as part of a balanced diet, surely one hamburger, french fries and a milkshake isn't going to make that much difference? That sort of argument doesn't really wash very well with me because it's hard for a person simply to have an odd burger here and there, while otherwise consuming a diet mostly made of plant material. You don't find vegetarians for example having an occasional burger, so in a practical sense it doesn't quite work that way. For those who do have an occasional burger, maybe two or three a week, if they are also consuming that same kind of food in their homes then that additional burger is really adding quite a burden to their diet through the course of the day and during the course of the week. One burger is very high in fat, very high in animal protein, doesn't contain any of the other useful things, and so it adds a burden, and in the study of China that we did, we found that even small additions of animal based foods to the diet begin to cause cholesterol to rise in the population as a whole, and that in turn begins to cause these diseases to appear. McDonald's distribute a leaflet which says, 'Everytime you eat a McDonald's you'll be eating good nutritious food.' What's your response to that? That's not true. We are not eating good nutritious food when we're eating McDonald's burgers. It's true that there are some nutrients in that food of course, but we can get those same nutrients from plant based material without suffering the adverse effects that happen to be present with the consumption of burgers. So, by any stretch of the imagination that is not good nutritious food, and I don't think anyone would really say that, with a straight face. McDonald's are expanding into more varied areas - not just on the high street but elsewhere such as airports, hospitals and particularly in England McDonald's are moving into the sponsirship of schools. What's your reaction to that? I didn't know that McDonald's are moving into hospitals and I find it really alarming that it is being allowed. It would be particularly troublesome for the patients in the hospitals. They are the people who most need good sound nutrition it seems to me, and the worse thing that they could possibly do, at that time, is to start consuming these high fat, high animal protein sorts of products. That is not going to help them. We have really outstanding evidence now that heart disease in the advanced stages can actually be reversed by consuming an all plant based diet. The evidence that we're now gaining is very exciting. That really is atrocious, that McDonald's is actually invading that arena, for the visitors to the hospital, but particularly for the ailing who are in the hospital. The question concerning McDonald's foods being introduced into the school system is quite a serious problem. I happen to have a student, a middle aged woman, who recently did a study in the States for her PhD dissertation on the local school system. Her study showed that children in the very first grades, when they're given the opportunity of exploring food, through preparing the food and learning about where it comes from, (particularly the kind of food, that many people think rather odd; plant food, cous cous and all the like), when they're exposed to those sorts of ideas at the beginning of the school year really get quite enthused about it, and then by the end of the year not only had the children changed their own diets dramatically, they went home and told their mothers about it, their mothers started changing their diet, and the little town grocery store started introducing new shelves to put these kind of foods on. In fact the story made the New York Times not too long ago and showed that children apparently do not like animal based foods, that's something that they have to be trained to eat. Secondly it showed that children can be actually educated in the public school system in good health, and then actually take the message home, and convince their parents. It's the other way around from what we all have tended to think. It's quite dramatic. In fact the story made the New York Times not too long ago and showed that children apparently do not like animal based foods, that's something that they have to be trained to eat. If you had the opportunity to address the head of McDonald's and you could actually say to him what you think about the whole picture that McDonald's paints to the world what would you say? I would basically show him the data I have found. Anyone who is willing to sit down long enough to actually look at the evidence really cannot come away without being impressed with the facts. I would appeal to his public and personal consciousness, and then encourage him to begin to shift his dietary ethos to a more healthy kind of diet and begin to try to educate him and the public on this better nutrition. I understand that in a free market system they are going to serve whatever they can sell, but at the same time they can take some leadership and try to get people to think differently. What was your reaction to the stand Dave and Helen are taking, and the situation that they find themselves in? I think David and Helen are doing something really quite extraordinary. They're really sacrificing a lot to do this. I really admire someone taking on a cause like this, and standing with it and staying with it. Their arguments are very consistent with what I think is basically good science, and I have enormous respect and admiration for what they're doing. Obviously they're at a disadvantage in the courtroom not having been trained in the law. I really wish them the best. What will happen if McDonald's win? How do you think they will capitalise on that? I really worry about McDonald's winning. I have worked for a long time in third world countries; in China and the Philippines, in Indonesia and Haiti; and I've seen in recent years how McDonald's have begun to invade these areas. They see this as an exciting new target area to produce their products. They're going into these countries and they have the advantage of being western, in a sense they have that marketing advantage. They're really having quite an impact, and if they win this case they're going to be able to tell these countries and these policy makers, look, we've won a case in a country that has one of the oldest and most prestigious legal systems in the world, and they're going to use it in their adverts, without a doubt. It's going to be tragic, it's going to be a disaster. It's very insidious what they're doing. It's clear that science is really on David and Helen's side, it's not on McDonald's side, and they're really going to distort the truth, and they're going to use it for good, for marketing purposes in these countries. I really hope that the judge will find a way not to allow that to happen. What would you say about a diet that is high in fat, sugar, animal products and salt, and low in fibre, vitamins and minerals, and because eating it may well make your diet high in fat, sugar, animal products and salt, and low in fibre, vitamins and minerals you run a very real risk that you will suffer cancer of the breast or bowel, or heart disease as a result? I totally agree with that statement. I think it's really hardly debatable, we can talk about the details, or the mechanisms by which this works, and have a considerable debate on that perhaps, but as far as the ultimate effect is concerned, it's supported by enormous amounts of scientific evidence. The simple facts are, that that kind of diet does raise the risks of these diseases. So it's an excellent statement. I support it fully. In the case of heart disease, when one consumes a burger that's high in fat, high in cholesterol and high in animal protein, it's quite, quite clear now today that, these particular components of that food when consumed, lead to a high fat content in the arteries, a high cholesterol level in the arties and deposition of cholesterol in the legions that ultimately lead to heart disease, and so that is really quite well accepted, quite clear. Now we're beginning to learn in recent years, that, although, different mechanisms are involved, the same result occurs, with respect to the cancers. These cancers begin to grow, more rapidly under those conditions, not necessarily because cholesterol goes and actually causes the cancer itself to grow, but it's a whole constellation of things that happen. So the result in the case of cancer is the same as it is for heart disease. That is to say, these kinds of nutrients, that kind of food promoted in a McDonald burger does lead to high cancer rates, fast growth of the cancer tumours themselves. It may involve a somewhat different mechanism of course from the mechanism associated with heart disease, but nonetheless the result is the same. You don't feel that's an overstatement? McDonald's may well claim that this is just scaremongering - that particularly in America families, ordinary people have been eating burgers for a greater part of this century and no-one is dying in the street, people are enjoying them. What would your response to this be? No, it's not scaremonging, what I'm talking about is based on evidence obtained on average from large populations, as well as based on evidence from laboratory studies looking at specific mechanisms as to how it works, and put these two bits together, the big picture together with the way it works and it makes sense. This really isn't scaremonging but the problem is that there are some individual families of course, who can do things wrongly most of their lives, and more or less get away with it, they're rather fortunate I guess because they don't have perhaps the genetic predisposition for getting the disease in the first place, I mean the same as is true for some people who are able to smoke til they're 90 or 95, and, and get away with it, but who's going to doubt that smoking is an inadvisable thing to do just because we find an odd person who can live their lives for that length of time and get away with it, that's the kind of argument that's actually been used to try to say that this is scaremonging and it really isn't, and one really has to look at all the data togeth and realise that the is a large proportion of people who are advsely affected by this kind of food. What I'm talking about is based on evidence obtained on average from large populations, as well as based on evidence from laboratory studies looking at specific mechanisms as to how it works, and put these two bits together, the big picture together with the way it works and it makes sense. How would you describe your own dietary tradition? I was actually raised on a farm, and I milked cows until I was well into college, and obviously I ate that kind of diet. When I went away to college I was in pre-vetinary medicine as an undgraduate, but then in my graduate studies I did a PhD dissitation on figuring out ways to produce animal protein more efficiently, so we could eat more animals. That was my background. I was totally a farm boy, totally into that territory. It wasn't until I went away and spent some time working in the Philippines co-ordinating a nation-wide programme for the feeding of malnourished and starving children, where we were led to believe that these children were in that state because they didn't get enough of a western kind of diet, that I started seeing evidence that that assumption wasn't correct. In the 60s and early 70s the more I looked the more I saw that it simply wasn't true. I engaged in research over the years trying to figure out why we were so mislead for so long. And what effect did this have on your diet? Did you change it? Yes I did. In the middle 70s, I, my wife and our 5 children, started to change our diet and around the middle 80s or so, we had become very close to being total vegans. Our 5 children are, and of 4 who've got children all are total vegans. Do you think your grandchildren will look at people eating high fat products like this in the same way we look at smoking today? Smoking is a disastrous practice and I don't want to diminish that in any way, but finally, the public have begun to accept that. I also think that in another generation or so, people are going to begin to recognise that eating a plant based diet is really a far better way to live, and enjoy good health for long periods of one's life. Incidentally, that kind of eating was much better appreciated and accepted and promoted as long ago as the ancient Greek times. Some of the leading Greek philosophers and others who thought about medicine, diet and disease wrote surprisingly impressive observations on the relationship between eating that kind of food and good health. It all sort of disappeared around 300 or 400 AD, for some strange reason lots of things disappeared about that time, and I think that we're just now beginning to come out of the dark ages and going back to this; rediscovering what was well known to these medical people and philosophers. You're giving a lot of weight to a study that was done in China, but who's to say that those results will translate to a population in say the UK? The results that we got in China are relevant to what we are interested in here for our populations. As the Chinese move from the countryside to the city, they quickly acquire the same diseases we get here. Furthmore, there are hundreds of studies now showing that people who move from one country to another where the disease risk is very different, take on the risk of the disease of the country to which they move while they keep their genes the same. In other words, diseases don't occur because of a genetic predisposition, it may for individuals be somewhat different, but regardless of our genetic predisposition, we can control whether or not that we get the disease simply through dietary and lifestyle changes. Diseases don't occur because of a genetic predisposition, it may for individuals be somewhat different, but regardless of our genetic predisposition, we can control whether or not that we get the disease simply through dietary and lifestyle changes. Okay, so, a few people may be in trouble eating this kind of diet, but then a few people are knocked over just crossing the road. Isn't this just part of the risk of everyday life? Well, not really. Let's use the case of smoking so we can put the thing in context. It's been estimated that the total number of people now living in the world who are going to die prematurely from smoking is of the order of 200 million people, that's a population approaching the size of the United States. When we compare the number of people dying from smoking with the number of people adversely affected by diet, for example, diet is often conceded as causing even great number of premature deaths than smoking. So, just using that very simple comparison, let me suggest that the number of people in the world today who are likely to die prematurely from poor diets, at least in the western sense, could easily be 200 or 300 hundred million people. These are big numbers, these are really big numbers. In fact, I would suggest that's a conservative number. Another way of looking at this is to say 60-70% of the people in the UK and the US and other western countries die prematurely from cancer, heart disease, diabetes and these other western kinds of disease. Since those diseases are preventable by dietary means, might we say that half, or 60-70% of these diseases really can be prevented at least until much older ages through dietary means. This is a large number of people, whatever that number is. Do you feel passionate about this subject? Yes I do. I think in part because I was in the other camp in a way, not intentionally, but that's just where I was, from my childhood on through, into science - and I got into science because I thought science was a place where we were supposed to look at things honestly and make our decisions accordingly. I saw evidence that didn't agree with the way I was doing things or the way before us, and so I had to look at that. I thought it was a very simple matter and I got quite excited about this kind of thing, and in fact what I discoved was an enormous hostility and antagonism to the promotion of these ideas. I have to say I became somewhat cynical of the institutions of science because of that. I started thinking a lot about why it is that the institution of science itself behaves in such a way? And, what I'm now discovering is that science is not so ideal, in the way I once thought. I was very naive. The institution of science is closely related to who provides the funds for the science to be done, either directly or indirectly. I think the indirect effect is even greater than the direct effects, and people in science advance their careers by how much research they do, and how much publicity they tend to get. And of course, they are going to advance their careers and get the publicity if they do the research that's generally accepted, in other words supporting the status quo. If a scientist comes along and says something different, they do it at their peril, because they just may not get the publications, they may not get the advancement in their care ers. That's a rather indirect effect, but nonetheless, it's a very serious effect, and they know it. And so, I think the institution of science, which has basically served a very reductionist way of thinking, that is producing little pills and magic bottles to do this that and everything else, that's what medical science has largely been, been fostering, been concerned with, and interested in. And of course it serves the free market system and it serves our sense of how to control disease through cure, but, it doesn't serve the public. Prevention is really the way to go, and at the centre of the plate for prevention is nutrition, how we decide to eat and how we decide to behave otherwise, and that's a very comprehensive sort of lifestyle dietary change. That's where we get good health - that's what the public needs to know, and science is not delivering it. When I find I get hounded for my views by some of my colleagues, on these particular points, it makes me angry and in a sense pursue the question even more. Do you see Helen and Dave having any real hope of effecting a change given their position as two individuals up against the might of McDonald's financial muscle and advertising budget? I would hope that David and Helen can make a difference. I guess that some of my cynicism is showing, and, I don't know whether they're going to win this particular case or not, I don't want to say, but, really they're up against, tremendous odds, and, time and again in the past, if we look at history, particularly the last 20, 30, 40 years, you know, that kind of effort has not succeeded very well, but nonetheless, we've got to keep trying. I think the world is changing to some extent in the sense that, one of the biggest innovations in my view that has come along in the last few decades is the vastly improved facilities for communication, I mean virtually anyone in our society can, can get together some equipment and get some ideas and, and basically go out and promote some information and let the public know, and so now the dispersion of information is I think more democratic than it has been, at least I think. Whereas before, 20 or 30 years ago, 40 or 50 years ago, I mean, information was held in the hands of a few, and I think this is going to make a difference. Would you not agree though that on the contrary, Dave and Helen could be silenced by the law of libel, by the legal process coming down on them. For people in the communication business: if David and Helen lose, we too lose, then I think that's quite a story to sell, and it should be told, you know. Here are all the factors, here's the kind of support they get from the scientific world, and, here's the message compared with the McDonald's message, you can decide for yourself. If they've lost, why did they lose? You know, just think about it, I mean, think about the resources that go into the McDonald's case compared to the preparation that David and Helen had to do. I mean it's a story that sells, you know how big government, big business in this particular case, it's frightening, it's really not very democratic I must confess, and it's a trend in a very dangous direction. If they lose the case, I don't think David and Helen are going to go away ... I would only hope that they just sort of redouble their efforts and continue at it because I think that the time will come when there are more and more people who will begin to understand what they're really saying. But are they still right to fight the fight and continue after the verdict? Oh yes, absolutely. If they lose the case, I don't think David and Helen are going to go away, I mean, from my little knowledge and little experience with them in the last couple of days, I don't think they're going to go away, I would only hope that they just sort of redouble their efforts and continue at it because I think that the time will come when there are more and more people who will begin to understand what they're really saying. I mean, if the public just knew what can be achieved rather cheaply and fairly easily, I'm convinced the vast majority of the public would buy into it. Right now the public is not being told the story very effectively, or at least it hasn't been told. I mean, the public tend to think, you know, that, 'I'm not going to get that disease, and anyhow, if I get that disease, doctors have some little pills or some medicines, you know, they'll take care of it for me'. I mean, that's what they've been told, and they sort of believe it I think. But it's really not true, and, it's very costly, and it's really a waste of one's resources and a waste of their life, you know to be getting involved in that sort of business. They can take control of their own lives. The public, the individual consumer can take care of, can take control of their own lives, if they just had the information on how to do it. I have a great deal of trust in the public, in the kind of decision they're willing to make, if they're just given the right information. I mean I'm basically a person that tends to think that there is a lot of goodness in all of us, and a lot of sense in all of us, really, and the extent to which we make bad decisions or do the wrong things, unfortunately, is often times the result of these rather insidious forces that exist, to try to cause us to think differently, and, because everyone wants good health, who doesn't want good health? And everyone would like to know, 'well how do I achieve it'? And they would like to actually see the evidence and see it clearly. Right now a lot of people will put that off because, they're not told very clearly how it really is, and, maybe make a decision for some other reason, but at least if they had good information, if they had good information they would really change. So the campaign goes on as far as you're concerned? Absolutely. Absolutely, because, you know, the other forces that exist in our society as I said, the good communication skills and opportunities that now exist, there'll be another day, another opportunity, but in the meanwhile in that particular case if they lose then I think we really need to focus on why did they lose, tell that story, because it's going to be a sad one. Do you think there is a contrast between the legal and real outcomes of the trial - in terms of victors and losers? Yes, maybe they will have lost the legal case, and it was based on good science, but that story in itself has to be told. Some people would argue that, they didn't prove the science, they didn't bring out enough of the evidence, or something like that, I mean, people might say that kind of thing but because most of the science work that's actually dealt with in this case is very narrowly focused, and unfortunately rather severely constrained, to very narrow slices of the total picture, that's kind of dangerous. So the full scientific story is not being told in that courtroom, and I worry about that, the scientific case is not necessarily going to be proven, in this situation. David and Helen might be losing the legal case perhaps, or they might lose the legal case, but they will have gained something in the area of science, and in a larger sense in the public perception of what they were really doing. Their story needs to be told to the public and I fear for example that, as I understand it, this is not being adequately covered in this country. Their positions are not being adequately covered, and, so there is a missing link. There needs to be more coverage of what they're doing, the media needs to be more open-minded about what's really happening and tell the story. So the full scientific story is not being told in that courtroom, and I worry about that, the scientific case is not necessarily going to be proven, in this situation. Helen and David might lose the case on one hand, but on the other hand, this message is so powerful it will go on, there is no question about that, and there'll be places for Helen and David to continue to participate in the future and many other Helens and Davids, you know, round the country as the evidence is so persuasive, and, it's so good for the public to know, so there is no way that this could stop. It'll continue, regardless of what happens in this particular case, and so I would hope that David and Helen will take heart in that, and just continue to do what they're doing. Do you see the two participants in this case as representative of two very differing movements? Yes, I think David and Helen represent something inside of all of us really, in wanting good information, so we can take charge of our own lives, I think that movement really is beginning to take hold, I see it in the United States, and, I'm sure it's also beginning to rise here too. The world of power and money of course will come to live with that perhaps, but it's become quite serious, in may areas of our lives in the last few decades, there are a lot of people I see who are saying 'enough is enough', you know, 'we want to know more about what we can do with our own lives in our own ways without having to suffer the consequences of all this power and money', and so I think it's true that a sort of emergence of a consciousness, of a public consciousness, and a sensitivity to the problems in our society is occuring, that average people identify with, and want to know more about and they want to be able to participate in certain ways. I mean, in that sense I'm rather optimistic and hopeful because I know it's related to the fact that 'the power and the money' has done tragic things, and they are still very powerful and there is a lot of 'power and money' there, but, thanks to the world of communication, books and the media, it can make a diffence. It really can make a diffence.